Arron Carter and his breeding program provide the first line of defense in the high-stakes battle against stripe rust—the number one threat to wheat. The fungal pathogen that causes stripe rust is ubiquitous in wheat-growing regions. Its airborne spores can ride the wind for miles upon miles. When conditions are right, it grows quickly, sucking water and nutrients out of the leaves and crippling a plant’s ability to produce healthy seeds. Stripe rust takes a heavy economic toll. Treating infected crops with fungicide is expensive—but if not treated in time, it can cause up to 80 percent crop loss for the world’s third largest crop. To make matters worse, it frequently mutates. There’s no way to tell how long any wheat variety will maintain its disease resistance. That uncertainty is what keeps Carter’s winter wheat breeding program hopping. There are about 80 known stripe-rust resistance genes, and WSU’s plant breeders and crop scientists are constantly looking for new genetic combinations to keep ahead of the evolving threat. 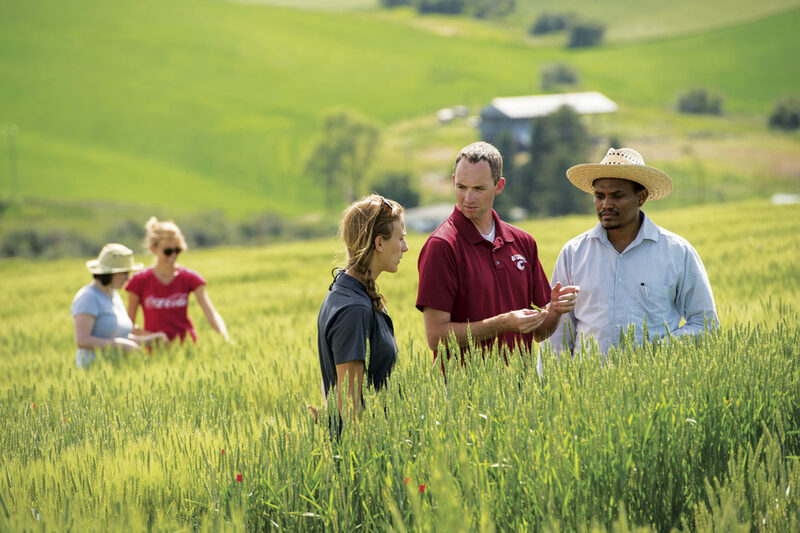 In the University’s plant growth facility in Pullman, wheat breeding runs on an accelerated cycle of up to three generations of wheat every year. The brightly lit greenhouses atop the building are its most obvious feature—but the process really picks up speed in the lower levels. Genetic analysis ensures that the breeders are cross-pollinating varieties that have specific desirable genes. Vernalization chambers put winter wheat through the cold period necessary for reproductive growth to begin. Humidification chambers provide perfect conditions for stripe rust to grow, so a wheat variety’s resistance (or lack thereof) can reliably be observed. Where it once took over a decade to identify and fully test an improved variety of wheat, it now takes only seven years on average. Right now, WSU has three winter wheat varieties and one spring wheat variety awaiting approval by the University’s Variety Release Committee. If approved for release, they’ll be available to growers in spring 2019. And there’s a steady stream of new varieties in the works. In the longer term, the University’s wheat breeders are working to breed resistance genes for several different diseases into future varieties.